As we quickly approach Thanksgiving, I am looking forward to, in addition to the sleu of family, food and football, our annual outing on Black Friday. As you might remember from last year, we don't do the full-scale Black Friday shin-dig. We prefer to sleep in a bit, eat some pie (YUM, lemon-meringue is clutch) and have some coffee, and then leisurely head over to Roswell's Shoe Gallery Warehouse for shoe-shopping mania. My mom is a teacher, and so can't wear heels all day to work. So her approach to SGW is looking for comfortable shoes that also have some style. It's hard work, though. The super-cute ballet flats have zero support, and then the super-supportive shoes often come off as looking grandmotherly. Mom always does a good job picking shoes right in the middle of those two extremes, but Dad is always way more interested in my fun heels than her supportive flats haha. In any case, I thought of this entire exchange the other day as I picked up two pairs of shoes on deep discount. The first pair scream "comfortable" to me, as they should -- I needed a new pair of flats to walk in to MARTA during the winter. They have to be comfortable and warm -- something most ballet flats really aren't. And honestly, I needed them to be cute, but they didn't have to be eye-catching, as I often swap them out for heels once I get to my office. So I picked up these -- except in black. Pardon the picture, it's not mine. Apparently this is why they were on such deep discount. 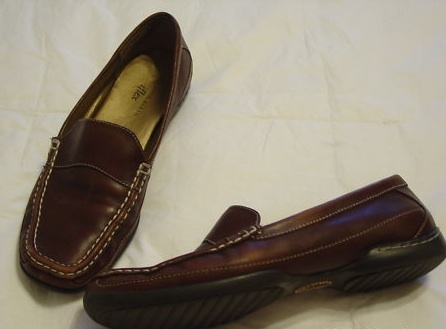 These Anne Klein loafers have all but disappeared from the web in the meantime, to be replaced by newer versions (the patent leather is cute!). But never fear, Dad. 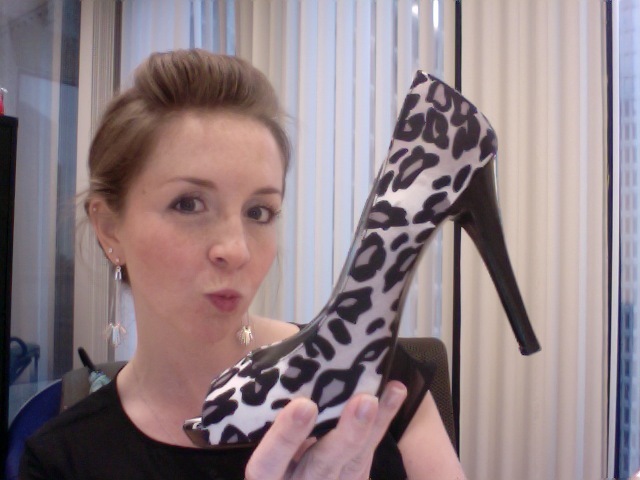 I got some "fun" shoes, too, in typical Katherine style. Behold. Can't wait for next Friday morning!